Feeling weepy today — not necessarily a bad thing — the happenings around me and in the world always cause me to ponder life. I’m really missing my parents today — this was Daddy’s favorite time of year — I’m looking forward to Dave reading the Christmas Story tonight and the account of Jesus birth. I’m struck by all the sadness and chaos in the world — in our United States — I’m looking forward to Christ’s Second Coming…come quickly, Lord Jesus. My heart and prayers are with Pastor Saeed Abidini and his precious family — this is their third Christmas without Pastor Saeed — I’m praying for the homeless in our community and that God will visit CHRISTmas on them in a way that they will know that Jesus has come to seek and to save. I have managed to ignore the commercialism of Christmas this year — I purposed in my heart to do that this time. I’m trying to do a better job of recognizing that Christmas isn’t about America’s illusion of Christmas — I don’t know of very many churches that will come together Thursday morning, as a Body of Believers to worship Christ — Pastors want congregants to “be with their families” — what happened to the family going together to worship the Christ?? That is a part of the fibrous break down in America — we see church as a social event rather than a worship event. I don’t know if this will be the first of many more Christmases for me or the last — but whichever it is — I bow down and worship CHRISTMAS — Christmas isn’t a day that we made up and put on a calendar — it isn’t a card with a snowy scene — it isn’t over-excited children ripping open packages on Christmas morn — CHRISTMAS is JESUS – God becoming man and dwelling among us — the Second in the Trinity dying on a rugged cross to redeem us — that ONE rising from the grave on that third and glorious day declaring, I AM — won’t you worship CHRISTMAS with me this year? 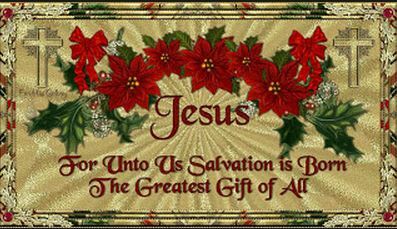 If you have not received Jesus as your personal savior — I invite you to come before Him today and receive Him — that is why He came — He is your GIFT! That is my prayer today! Merry Christmas.